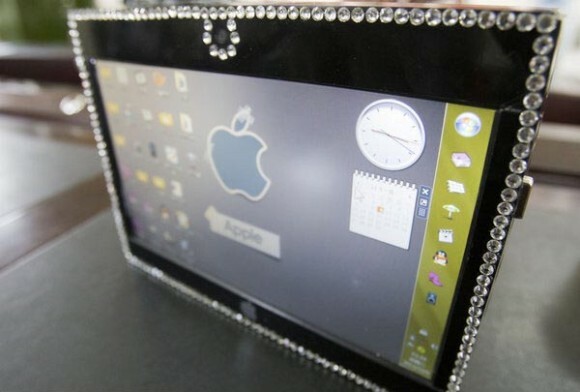 A Chinese student has created a tablet for his girlfriend as he couldn’t afford one. The student used an old laptop and hooked it up with a touchscreen and a battery that he bought online. Wei Xinlong made the tablet in 10 days and it spent $125 to make the tablet. “The main board, video card, CPU and screen were all from the old laptop, but I bought the touch screen and battery online,” said Wei in an interview with China Daily. The tablet runs on Windows 7 and weighs somewhat like a big laptop. “This is the best gift I’ve ever had, and I will keep it forever,” said Sun Shasha, Xinlong’s girlfriend. She has added rhinestones to the tablet and now uses the device to surf the web, watch videos and read books. Xinlong has even added a home screen button and an Apple logo and has also posted details about his project online that has made over 100,000 hits in just three days.